(JTA) — The House of Representatives ended this congressional session without taking action on a bill targeting campus anti-semitism, a measure that had been backed by mainstream Jewish groups, criticized by civil libertarians and passed unanimously by the Senate on Dec. 1. Rep. Bob Goodlatte (R-Va.), chairman of the House Committee on the Judiciary, did not advance the bill through his committee, a congressional staffer told JTA. Congress formally ends its session on Monday afternoon, but the session is pro forma and most members are already back in their districts for a Christmas break. With the end of the session, bills still in committee lapse. 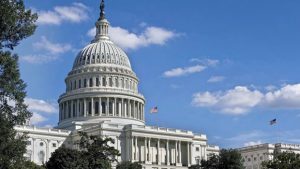 The vast majority of bills don’t make it through Congress because of time considerations, although Jewish Insider reported Friday that Goodlatte opposed “rushing” the bill through the House without adequate study. The antisemitism bill’s sponsors likely will reintroduce a version of the bill in 2017, their staffers told JTA. Critics of the bill included Michael Macleod-Ball, chief of staff of the American Civil Liberties Union’s legislative office in Washington, who told The Forward that the bill could impinge on the free-speech rights of critics of Israel. The act “opens the door to considering anti-Israel political statements and activities as possible grounds for civil rights investigations,” he said. Kenneth Stern, who as the American Jewish Committee’s former specialist on antisemitism and extremism wrote a similar definition of antisemitism later adopted by the Department of State, told The Forward that the congressional version is “both unconstitutional and unwise.” A number of left-wing and pro-Palestinian groups had criticized the legislation. 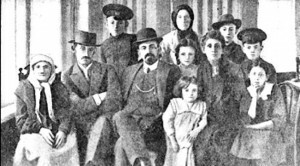 On Trial: Menakhem Mendl Beilis, whose blood libel trial took place in Ukraine in 1913, with his family in the Russian Empire of the 1910’s. Germany was ordered to pay the heirs of a Jewish department store chain nearly $68 million in restitution and interest for properties confiscated by the Nazis. The ruling by a Berlin administrative court for the heirs of the Schocken family was announced formally on Thursday, according to German news reports. The court had made its ruling last month. Before World War II, brothers Simon and Salman Shocken had opened numerous department stores, mostly in what later would be East Germany. Reportedly the most well known was the store in the city of Chemnitz, in a building designed by the architect Erich Mendelsohn. After German unification, the state paid the family about 30 million Deutschmark, or about $27 million, in restitution for the Chemnitz building alone. It now houses the German state museum for archaeology. In 1938, the department stores were “aryanized,” or confiscated. Their value is estimated at about $41 million; the rest is interest. The decision may be appealed to a federal administrative court. Salman Schocken also founded Schocken Books in prewar Berlin. He later moved the company to prestate Palestine and the United States. Germany has been debating circumcision since a German court ruled in June that the ritual was unlawful. “For 60 years I have defended Germany as a survivor of the Shoah. Now I ask myself if that was right,” she wrote. Knobloch is president of the Munich Jewish community and vice president of the World Jewish Congress. There is a solution to get us beyond the seemingly endless stalemates and complications that continue to characterize the ongoing debate over Holocaust-era insurance claims. And I do not believe it can be found in the well-intentioned bill before the U.S. Congress. This different approach will put money more quickly into the community of the survivors and their families, minimize huge financial rewards for certain lawyers, and help bring closure to this extremely painful process. I propose that the relevant insurance companies agree to the appointment — at their expense — of an independent monitor who could determine whether all potentially valid but as yet unresolved Holocaust-era claims are being honestly processed under the relaxed standards of the International Commission on Holocaust Era Insurance Claims, or ICHEIC. Some history of how we arrived at this point is in order. For more than 50 years after the end of World War II, many German and other European insurance companies refused to honor life insurance policies that they or their predecessors had sold to Jews who eventually perished in the Holocaust. Legislation that would allow Holocaust survivors to sue European companies for unpaid life insurance benefits worth an estimated $20 billion has passed its first test in Congress. The bill, authored by Rep. Ileana Ros-Lehtinen, R-Miami, was unanimously approved by the House Committee on Foreign Affairs Wednesday. Next stop: the House Judiciary Committee. The legislation would give survivors the right to sue Germany’s Allianz SE, Italy’s Assicurazioni Generali and other major European firms in U.S. courts to recover the value of life insurance policies bought before WWII. It would also force those companies to disclose lists of policies held by Jews during that era. “This bill is the last hope for Holocaust survivors to obtain justice,” said Ros-Lehtinen, chairman of the foreign affairs committee. Peter Bober, the mayor of Hollywood, Fl., since 2008, epitomizes what the late US District Court Judge Whitman Knapp (for whom I had the great privilege of clerking) used to refer to as the Equine Theory of Life: there are far more horses’ posteriors in the world than horses. Elected after a nasty campaign against the previous mayor, Mara Giulianti, Bober, driven by his loathing for just about everything he inherited from Giulianti, seems intent on harming if not destroying the Holocaust Documentation and Education Center, one of the most important institutions of its kind in the nation. Founded in 1980, the Center’s stated mission includes documenting and preserving the eyewitness testimonies of Holocaust survivors, liberators, and other eyewitnesses as well as serving as a non-denominational resource and reference for government, education, and human rights institutions, and organizations throughout the world seeking to document and study the Holocaust. Under the leadership of its president Rositta Kenigsberg, the daughter of a Holocaust survivor who happens to be both a colleague and a friend of many years, the Center has been at the forefront of Holocaust remembrance for decades. It has organized major educational symposia and workshops and sponsors a speakers’ bureau of survivors who regularly address school groups across Florida and elsewhere. Kenigsberg was also instrumental in the Florida legislature’s 1994 enactment of a law mandating Holocaust education in that state, and she served for ten years as chair of Florida’s Commissioner’s Task Force on Holocaust Education. Menachem Z. Rosensaft is vice president of the American Gathering of Jewish Holocaust Survivors and Their Descendants. He teaches about the law of genocide and World War II war crimes trials at the laws schools of Columbia, Cornell and Syracuse.